The DragonFly Intelligent Advertising Vehicle enables advertisers to offer a mobile, on demand and computer vision-powered autonomous showrooming experience to consumers. THE WHAT: PerceptIn will make its DragonFly Intelligent Advertising Vehicle available to select companies in the U.S. in the first quarter of 2019.The DragonFly Intelligent Advertising Vehicle offers early adopter advertisers and Fast-Moving Consumer Goods (FMCG) companies a digital out-of-home (DOOH) advertising experience to drive brand awareness and maximize engagement with on-the-go consumers. 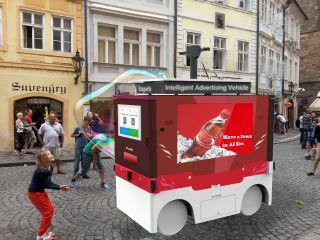 PerceptIn’s Intelligent Advertising Vehicle gives retailers and advertisers a mobile showrooming experience that can capture unique insights on consumer engagement with new products through its advanced computer vision and robotics technology. The DragonFly Intelligent Advertising Vehicle is also integrated with location-based services (LBS) to provide retailers and advertisers with insights on customers based on their location data and/or time of day constraints, or a combination of both. THE WHAT ELSE: The DragonFly Intelligent Advertising Vehicles provides measurable advertising ROI. Within a 15-minute test run on a commercial complex, the DragonFly Intelligent Advertising Vehicle was able to attract more than 1,000 viewers. Approximately 58.2 percent of these viewers were highly engaged as they viewed the advertisement for more than five seconds. Using conventional advertising metric terms and within 15 minutes of operation, the DragonFly Intelligent Advertising Vehicle successfully made more than 1,000 impressions and achieved a 58.2-percent click through rate. THE BOTTOM LINE: The DragonFly Intelligent Advertising Vehicle, which operates in low-speed scenarios such as convention centers, corporate and educational campuses, amusement parks and malls, is equipped with digital signage that delivers high-quality video advertising. The vehicle is also equipped with a vending machine for FMCG companies looking to increase brand awareness and product sales. Consumers can safely “hail” the vehicle from their mobile device or stop the vehicle when they see it. “Cost-effectiveness is a crucial factor for ubiquitous deployment when it comes to building an affordable and reliable autonomous vehicle for any industry. Nonetheless, affordable perception sensors may impose challenges to the motion planning sub-system," said Liang He, Chief Scientist of PerceptIn. "What is unique about PerceptIn's motion planning system is that we use recurrent deep neural networks to approximate systematic noises, which may include control noise, perception noise and localization noise, thus we were able to enable reliable and safe autonomous mobility on affordable hardware." PerceptIn is now selecting customers for their self-driving vending machine pilot program in the U.S. The DragonFly Intelligent Advertising vehicle will be available for purchase in the U.S to select customers in the first quarter of 2019 for $40,000.